Turnover Bridge is, despite its name, a variant of Whist for two players. Unusually among trick-taking games, each player only has two cards that they can keep secret from the other player. The rest of their cards can be seen by their opponent, helping both players form ideal strategies. 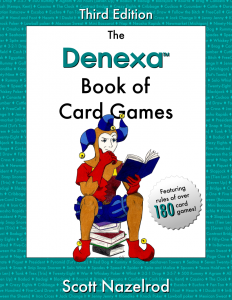 Almost half of the cards in the deck are dealt face down at the beginning of the game, however. That means that as the game goes on and those face-down cards are turned over, what constitutes an “ideal strategy” might change quite a bit! The object of Turnover Bridge is to capture fourteen or more tricks. 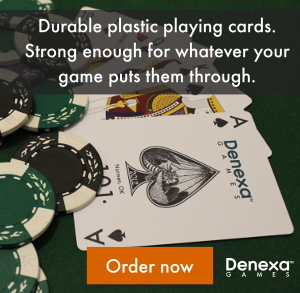 To play Turnover Bridge, grab a deck of bridge-size Denexa 100% Plastic Playing Cards. Shuffle and deal twelve cards, face down, in a line in front of each player. Then, deal twelve cards face up, one on top of each face-down card. Deal two more cards to each player, face down, exhausting the pack. The players may look at these last two cards, but not the face-down cards on the table covered by the face-up cards. In Turnover Bridge, not all of the player’s hand is accessible to them at any given time. Initially, the only cards they may play are the twelve face-up cards from their hand, plus the two cards they hold hidden from their opponent. 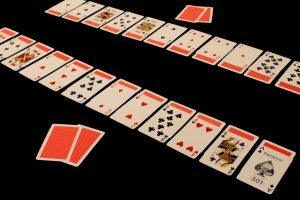 When a face-up card is played, the face-down card beneath it, if any, is then turned face up and becomes available for play. The non-dealer leads any card they can access to the first trick. The dealer then responds by playing an accessible card, following suit if able. If a player can’t follow suit, they may play any card they wish. Whichever player contributed the highest spade (spades serving as a permanent trump suit) wins the trick. If nobody played a spade, the higher card of the suit led takes the trick. (Note that this means that when a player cannot follow suit, they cannot take the trick except by playing a spade.) Cards rank in their usual order, with aces high. When a player wins a trick, they collect the cards and set them aside in a won-tricks pile. Each trick should be kept separate, such as by placing them at right angles to each other. The player who won the trick then leads to the next one. Game play continues until one player captures fourteen tricks (a majority of the 26 tricks in the game). That player is the winner, and play normally ceases at that point. If all 26 tricks are played out, and it is found that the tricks have been split 13–13, then the game is a tie.